Refurbished in 2014, the contemporary serviced apartments at Native Aldgate Tower Hill in India Street is in a lovely position near the Tower of London. Just three minutes’ walk away is Fenchurch Street station providing access to National rail services. Aldgate tube on the Circle and Metropolitan lines is also close by and can be reached in four minutes. Venture out from the residence and visit the Tower of London a mere ten minutes’ walk away, likewise the amazing architecture and cultural experiences London has to offer are all around. There are a plethora of eateries, bars and restaurants in the area, too. 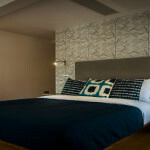 The stylish serviced accommodation is comprised of premium studios, premium terraced studios and open plan one bedroom apartments, all are suitable for 2 guests. 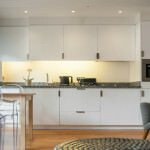 Each style of short stay apartment is complete with a white gloss modern kitchen, (complete with microwave, dishwasher, fridge freezer and hob), a supremely comfortable living space and contemporary bathroom. Native Aldgate Tower Hill apartments are air conditioned and boast stunning floor-to-ceiling windows. Some of the suites have balconies whilst others have breath-taking views of the city. 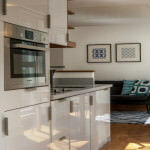 Wooden flooring and tasteful interiors combine to create a comfortable home from home in the capital. 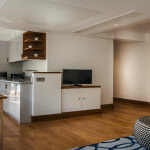 For guests convenience Native Aldgate Tower Hill has lift access, and weekly housekeeping services. For safety there is CCTV cameras and as client’s check-into their apartments by special codes provided prior to their arrival this property really feels like home.